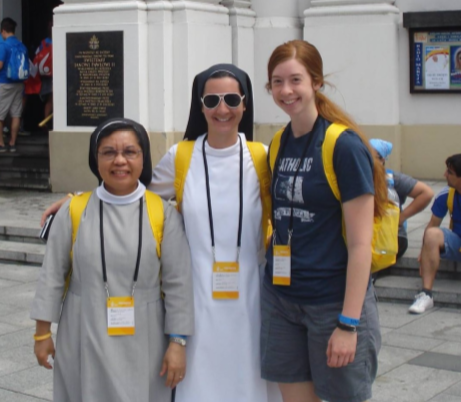 At the World Youth Day in Poland 2016, Laura(now Postulant Laura), Sr. Fidelis Marie and Sr. Gabriella together with our group, 47 members from Madison Wisconsin, were among the crowd of 2.5 million pilgrims mostly young people from almost 200 countries to meet with the Holy Father Pope Francis at Campus Misericordiae (Field of Mercy) at the Vigil of the WYD in Krakow. Spending 5 to 6 hours by foot loaded with our backpacks and sleeping bags, somehow exhausted but with a spirit of enthusiasm and excitement we reached that place late afternoon of July 30. Along the way, walking side by side with other groups of different nationalities and colors and languages was a very particular experience. We had the possibility to get to know and interact with other pilgrims with spontaneous smiles. The mood was joyful, other groups prayed the rosary, others chanted hymns and praises to God as well as dancing in between rest, certainly not without challenges and inconveniences. As Poland is celebrating 1050th anniversary of its conversion to Christianity, it is fitting to host the World Youth Day. 2. Krakow, Krakow is particularly important as the Capital of Mercy, host of the WYD 2016. Cardinal Dziwsz, the former Secretary of Pope John Paul II gave the Welcome address to Pope Francis and to all participants during the WYD. It was here that St. Faustina Kowalska to whom the Divine Mercy was revealed. The home Diocese of our St. Pope John Paul II. Our Pilgrimage to the Shrine of Divine Mercy and visit to the home Parish of Pope John Paul II in Wadowice lifted up our spirits in thanksgiving to God as these 2 Apostles were canonized Saints during our lifetime. I was impressed and touched to see many young people praying so devoutly on their knees. The English speaking Catechesis of Cardinal Luis Tagle of Manila and Bishop Robert Baron and others were awesome. Another place in history, we visited was the former Nazi concentration and extermination camp in Auschwitz-Birkenau- (the symbol for the world of terror, genocide and the Holocaust) where we walked about 5 miles and it was a good given space to ponder on our individual and collective responsibility. Being there personally at that particular site where 1.1 million people were murdered touched me so much. Unfortunately the cell of St. Maximillian Kolbe was closed to the public due to security reasons as they were preparing for the visit of the Holy Father Pope Francis next day. The final part of the pilgrimage was our visit to the Shrine of the Black Madonna of Czestochowa of Jasna Gora, most loved and venerated by Pope St John Paul II and the Polish people. It was so fitting to have a concelebrated mass with other pilgrims to give thanks and praise to God for His goodness and loving protection during the WYD. 3. Warsaw, the capital city, we had some time to relax from the hectic itinerary of the WYD, the tour at different historical sites and beautiful churches like Church of the Holy Cross gave us a touch of their rich Christian heritage. Indeed, a beautiful pilgrimage realized in this occasion of the Jubilee Year of Mercy. Enriched with the mercy of God, we are very grateful and blessed being mandated by our Priory of Norfolk and for the support of our benefactors and the Madison Wisconsin group and all who made it possible and blessing for us to be part of WYD 2016.